‘The Studio in the Age of Post-Production’ might have been the subtitle for Bik van der Pol’s new book, which documents their projects since 1994, when the two artists – Liesbeth Bik and Jos van der Pol – began to work together under one composite name. ‘Fail, fail again, fail better’, the duo advises, quoting Beckett, in their short introduction. The failure here does not relate to the trials and tribulations experienced by the artist working in the studio but rather to the redundancy of the studio in an era when many artists prefer setting up situations to be experienced collectively instead of producing artworks to be contemplated privately. The shift from discrete art objects to shared experiences in the 1990s is usually associated with Nicolas Bourriaud’s ‘relational aesthetics’ and ‘post-production’. 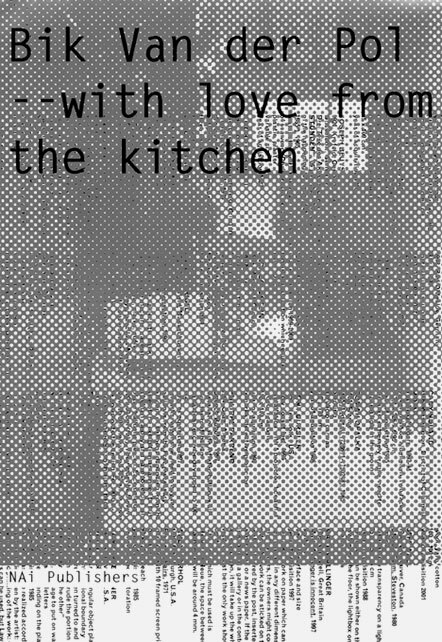 Bik van der Pol’s projects – which include fully functional kitchens, bookstores and beds – may recall Bourriaud’s convivialité when they are inhabited by people eating, reading and sleeping. But since the artists view the failure of the studio through the eyes of Beckett, their interventions, however user-friendly, are rooted in negation, absence, inactivity and futility. The traditional studio exists as a shadow cast by its neglected parts, like the kitchen and the shower – collective and intimate sites that prove to be the new tools of production, along with sites beyond the studio space, like bookstores, galleries, countertops and even picnic blankets. There are few artists who work with the negative, and Bik van der Pol must be the only ones to use negation in relational aesthetics, although their work can also be understood as a sculpture, albeit an architectural sculpture that always involves people. By building forms that evoke the traditional studio as an absence, their interventions lie somewhere between Rachel Whiteread’s architectural casts, which transform an empty space into a solid presence, and Andreas Slominski’s traps, which remain empty as the negative portraits of the creatures they are designed to capture. Bik van der Pol, inspired by Beckett’s failure yet unaffected by his malaise, deploy the negative to challenge, not only spaces, but also practices. Their copies – like the London ica bookstore recreated in Rotterdam’s Boijmans Van Beuningen Museum – are not simulacra but missing yet redundant doubles that already exist elsewhere. Users are encouraged, not to read, but to bouquiner with leisure; distraction, sleeping, boredom and even disappearance are other preferred modes of ‘action’ proper to the negative. A model like the ‘Cité des ingenieurs’ is equally futile since it portrays buildings that have been not only built but also abandoned. Adding beds to a re-screening of Andy Warhol’s ‘Sleep’ (1963) was not a comment on the film’s dullness but encouraged viewers to make yet another redundant copy of what already took place in front of the camera long ago. This negative approach to time pervades all of Bik van der Pol’s projects. It is an approach they share with Slominski, who completes his actions just before the exhibition opening, so that spectators always arrive too late and can glimpse only the carcass of an event. Their ‘Skinner’s Box’ (2005) – a model of the museum reduced by 2 / 3 to the average height of 10 to12-year-old children – prolongs the adult spectator’s tardiness by more than half a lifetime. While Slominski stages time negatively to play with loss, Bik Van der Pol are interested in playing with a collective Utopia and losing its linear reversible temporality, both forward-looking (avant-garde) and backward-looking (reactionary nostalgic revivals). If one considers how utopian temporality served fascism when it reached the mass and now serves global consumerism, one understands why Bik van der Pol embrace Beckett’s persistent failure along with its time that can be experienced only belatedly. For them, Utopia arrives too late and yet right now. What ‘could have been’ – an ica bookstore at Boijmans – actually becomes a reality. Bik van der Pol use the conditional tense, not to program the future, but to cut the present off from the past and from future speculation. They treat every site as an infinite verb that can be expressed only in past tenses within the present text. Architecture is not constructed but conjugated. Given Bik van der Pol’s penchant to deliver packages too late, it is not surprising that the essayists in this collection do not so much assess the work as reflect upon its impact in six realms – the institution, site specificity, reactivations, displacement, collaboration and information – which end with a catalogue raisonné, presented as ‘archive’. The autobiographical tone in many essays – far from anecdotal – attests to Bik van der Pol’s impact on individual practices within collective settings. Van Abbemuseum director Charles Esche asks how art can survive between markets and museums. Architectural engineer Wouter Davidts provides an excellent discussion of the studio’s disappearing act, which begins with Balzac’s painter Frenhofer and his invisible masterpiece. Sven Lütticken swiftly moves criticism from a second-degree spectacle to a minimal act. Philosopher Jean Attali addresses the negation of architecture in a generous text that presents urban voids as sites of mutation. Mary Jane Jacob considers the theory of the gift but unfortunately does not get far beyond the act of giving. Everyone invites readers to become free users of Bik van der Pol’s ideas. Designer Irma Boom was evidently inspired: Once again exploring the outer edge of the book pages, Boom had them cut in two alternating sizes that separate the sections from each other. One tends to open the book at the notes at the end of one section (on the left page) and the title page at the beginning of the next section (on the right page). Each section appears with respect to the last, thus too late. Recognizing the role of books within Bik van der Pol’s oeuvre, Boom found a way to get readers-users to start reading by perusing the contributor’s footnotes and biography in the closing archival list at the end of the essay. The failure to add Bourriaud’s Esthétique relationnelle (Dijon, 1988), to any footnote is a strategic decision, especially since Rirkrit Tiravanija’s recent retrospective ‘Tomorrow is Another Fine Day’ at Boijmans figures in the book. Instead of directly challenging Bourriaud’s theory (which gives a central role to Tiravanija), the contributors often refer to another critical vocabulary, which they adopt from other thinkers: icons (C.S. Pierce via Esche), gifts (Lewis Hyde via Jacob), models (Maria Lind via Verwoert). Yet reflection readily clarifies why Bik van der Pol would admire the empty retrospective gaze of ‘Tomorrow is Another Fine Day’ – enough to include two images of the show – and why they share little else with Tiravanija, let alone with Bourriaud’s programme. Since Esche, Verwoert and certainly Lütticken are among the best writers on contemporary art, the failure to position Bik van der Pol’s work with respect to Bourriaud is a failure that would suit the artists, if not Beckett himself. Jennifer Allen (Canada) is a writer and art critic based in Berlin.